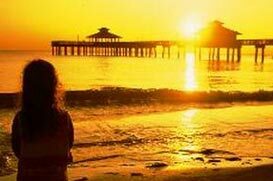 Located along Florida’s Gulf Coast, Fort Myers is home to roughly 70,000 residents as well as numerous attractions including beaches, fishing, and sports and shopping. Fort Myers was the summer homes of two of the most influential inventors in American history, Thomas Edison and Henry Ford, who lived next to one another along the mile wide Caloosahatchee River, which connects the Gulf of Mexico directly to the Atlantic Ocean via Lake Okeechobee. If you’re sports enthusiast, Fort Myers is the place for you, with over 40+ Public & Private Golf Courses, you’re bound to hit a hold-in-one. Fort Myers is also home to some of the best fishing in the state. MLB’s Boston Red Sox and Minnesota Twins both call Fort Myers their home for Spring Training. Also located in Fort Myers is the Minnesota Twins Single A team, the Fort Myers Miracle, and the NHL’s Carolina Hurricane’s minor league hockey team, the 2012 Kelly Cup Champions Florida Everblades of the ECHL. The Florida Stingray’s, a semi-pro football team were the 2013 UFF South Conference Champions. The Florida Firecats (Arena Football) also call Fort Myers home. Fort Myers is also home to Edison College & Florida Gulf Coast University, Florida’s fastest growing public university. FGCU made a huge splash on the national scene in the 2013 NCAA March Madness basketball tournament as a #15 seed which upset national powerhouse #2 Georgetown as they made it all the way to the Sweet 16.